I drink a protein shake every day for lunch after my workout and I think it has been a key part in losing the baby weight and keeping my weight down. Plus, it is such an easy way for me to get a quick and healthy meal in while I am trying to feed my 3 and 1 year old! I do get sick of the same old, same old so I was so happy to mix up my normal protein shake with the protein shakes that I received from CalNatural Svelte. CalNaturale Svelte provides you with the lasting nutrition and sustained energy you need to navigate through your active and busy day. Each rich, creamy flavor is created with 16g of protein from fresh organic soymilk, along with complex carbs for sustained energy. 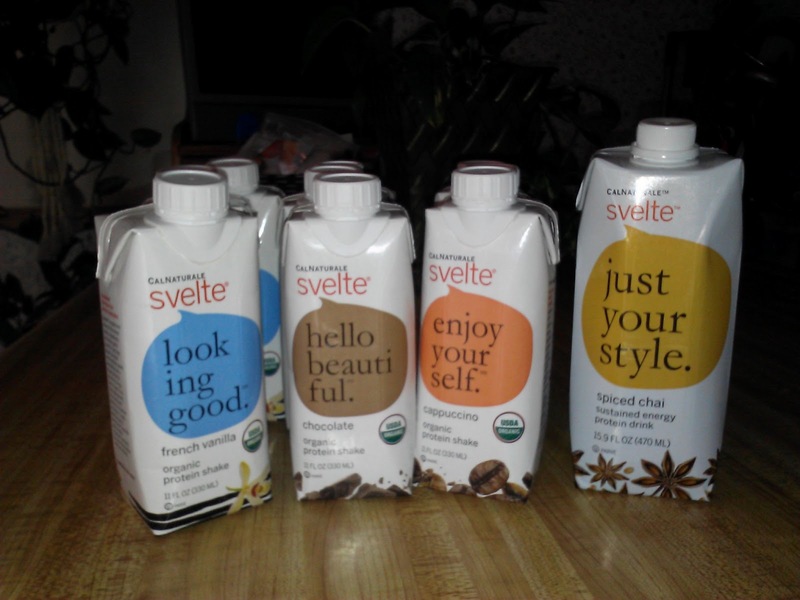 Svelte is tested to be low-glycemic and has only 9 grams of sugar per full bottle. It’s also a good source of fiber and is dairy-free and gluten-free. Svelte® is perfect as a delicious meal replacement, for pre & post-workout or as an anytime on-the-go snack. Each rich, creamy flavor helps to control hunger, keeps you going, and gives you natural goodness through important nutrients. I absolutely love the great variety of flavors they offer! I personally liked to mix the French Vanilla with the Spiced Chai and the Cappuccino with the Chocolate! It gives a great mix of flavor without it being overwhelming! I drink these protein drinks everyday for lunch and I absolutely enjoy them every time! My other protein shake never keeps me full for very long and and I was pleasantly surprised to find that CalNaturale Svelte kept me fuller, longer so I didn't indulge in other unhealthy foods! I felt full until my next meal and I didn't feel faint or starving an hour or two after drinking these! Best of all, they are made with organic and natural ingredients plus so many great minerals and vitamins so I am really happy about what I am filling my belly with! If you are looking to add a great protein drink to your daily routine (which I recommend all people do! ), then check out the CalNaturale Svelte protein drinks! They have great flavors, a lot of great minerals and vitamins and, of course, energy sustaining protein. They make a great meal substitution for lasting energy! Buy It: You can purchase CalNaturale Svelte protein drinks from the CalNaturale Svelte online store. What a nice review. I love Svelte. Have been drinking it for a while now and have turned many people on to it as well. Thanks.